Feel the thrill of the speed! Snowmobiles are convenient means of transport beyond the Arctic Circle. Locals use them anywhere from going to a grocery store to paying a visit to a friend who lives behind the hill. Each snowmobile is shared between 2 persons, so both can drive about 45 minutes. The route takes you to hidden places out in the wilderness, surrounded by beautiful landscapes. 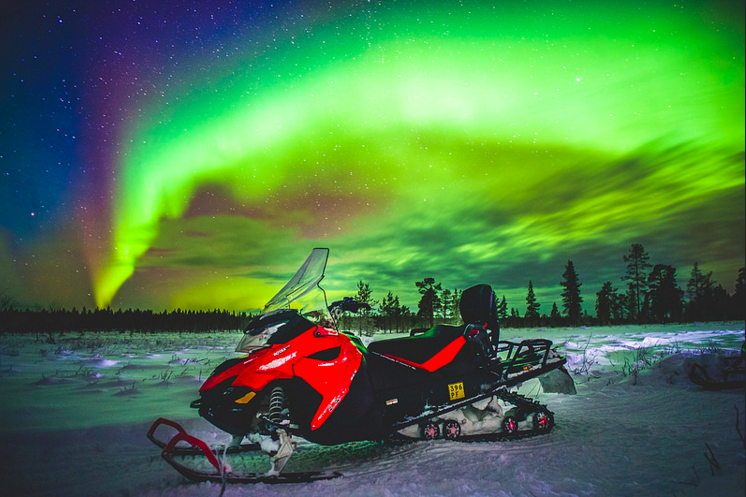 Take a snowmobile through the nocturnal snow-covered forest, far away from the residential areas and the light pollution, up to the silent snowy fells. Up in the fell, we warm up by the fire under the sky. Up on the fell you have time to take photos of the snow-covered conifers and the fells or just let the unforgettable sights enchant you. If you are lucky, you will catch the Northern lights! For people who have an adventure on their mind! This activity is for ages 18 and up. You can join the activity alone or with your group. The snowmobiles are new, easy to use and safe. Warm outdoor clothes are provided on the spot: overalls, shoes, helmet, gloves. You also have the possibility to book the Heated sleigh safari in case you want to enjoy the amazing Lappish scenery from the comfort of a heated sled. The silent, snow-covered forest, the nocturnal fell on the edge of the boundless wilderness, and the magical Northern Lights above you. Take a seat in the heated Aurora sledge and enjoy! Your guide tows the sledge with a snowmobile through the snowy, moon and starlit landscape, all the way to the top of the fell. After arriving, we prepare our cameras and take photographs of the northern night sky. We wait for the Northern Lights to appear in comfort by the fire, enjoying hot drinks and listening to tales until someone spots the first flare. Snowmobile Safaris is available daily. Please contact us for bookings!